Guys – Forgive my ignorance upon our meeting. The car that was sent to my hotel this morning came to the wrong address. Thus, I arrived at the studio twenty minutes late, barely in time to make my appearance, and conspicuously void of coffee. This is the salient point. Mike Rowe without coffee in the morning is a dramatically diminished version of himself. The synapses do not fire with their normal enthusiasm. Mental acuity suffers in ways both profound and measurable. Thus, when we grabbed this snapshot in the greenroom, your faces were vaguely familiar, as were your names, but for the life of me I couldn’t connect the dots in my harried condition. Now, two hours later, after a few cups of United Airlines better-than-average coffee, I’m sitting on the tarmac in Newark, as things come into focus. For instance, I now realize the guy in the tie is none other than Frank Siller. Frank – I didn’t place you immediately as Steve Siller’s brother. Apologies. Steve Siller, for those who don’t know, was one of the impossibly brave firefighters who died on 9/11. Frank was responsible for forming a foundation in his brother’s honor – a foundation that takes care of families of first responders who don’t make it back. It’s called the Tunnel to Towers Foundation, and they do really great work. Important work. I’m a huge fan of what you’ve accomplished with this initiative, Frank, and I really appreciate what you do. I just wanted to tell you that before taking off, and extend my belated sympathies for the loss of your brother. From what I’ve read, Steve was an unexampled human being. Surely, the city of New York is diminished without him. As for the guy in the uniform, his name is Randy Richardson. 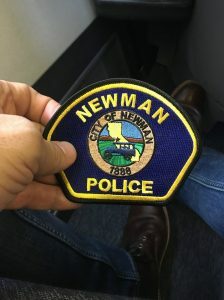 Randy is the Chief of Police in the City of Newman, not far from my home in California. Randy’s face also rang a bell, as did his name, but again, I didn’t quite connect the dots – even after he gave me this patch and his business card. Until now. Randy – I saw you on television in late December. You were giving a news conference about an officer who had been murdered by an illegal immigrant. I was once again on a tarmac, this time headed for Australia, desperate to leave the news cycle for a week or so and think about nothing at all. 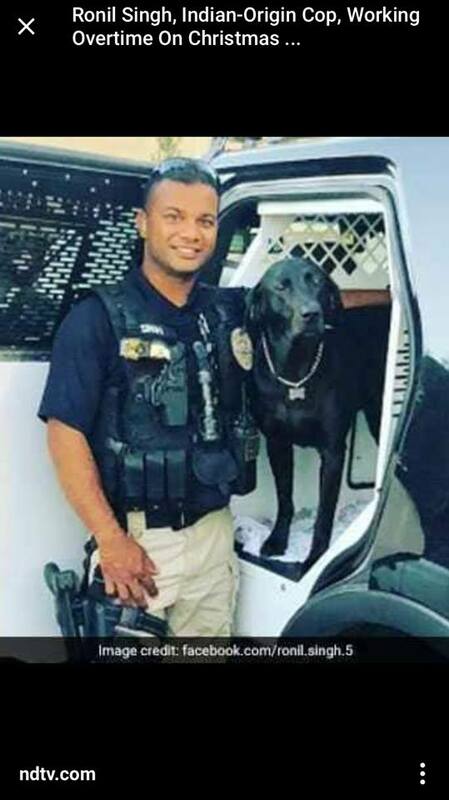 As you spoke, it struck me that this murdered officer – Officer Singh – was an immigrant who truly did everything right. A man who learned three languages, played by the rules, volunteered to work overtime on Christmas Eve, and basically lived to serve others. 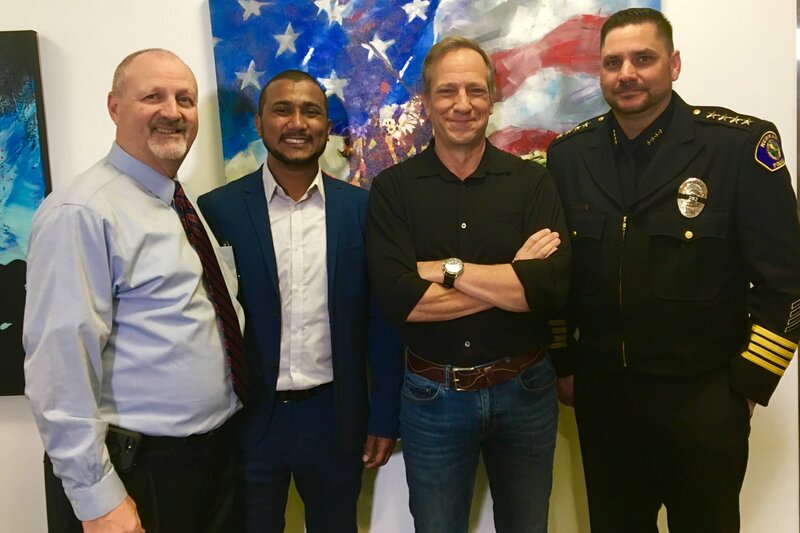 His name was Ronil, and his dedication to his community, his family, and these United States struck me as extraordinary. Surely, the city of Newman is diminished without him. After your comments, Randy, Officer Singh’s brother was invited to speak. He stood before the cameras, shattered. He was grateful to law enforcement for apprehending the man who took Ronil’s life, but his grief made it difficult for him to speak. As I watched him struggle in front of all those cameras, I found myself growing increasingly enraged that Ronil’s killer – an illegal immigrant who did everything wrong – was able to murder a legal immigrant who did everything right. The injustice of it all was just maddening. In fact, the circumstances of Officer Singh’s death, and the heartbreaking pain of his brother’s grief, made me so angry that I turned the channel. Why? Because, to my shame, I didn’t feel like being angry or sad. At that particular moment, I simply wanted to have a cocktail and go on vacation. And so I did. I left for Australia a few hours later, and never gave a second thought to the death of Ronil Singh, or the pain of his brother, or the unspeakable grief his needless death inflicted upon so many. I wish to apologize for that. Some things shouldn’t be forgotten or ignored, simply because they’re inconvenient to see or unpleasant to recall. Some things should be seen head on, for precisely what they are. Of course, no one knows that better than the other gentleman in this photo. The one standing next to me. The one who asked for a photo in the first place. His name is Reggie. Reggie Singh. The brother of the murdered cop. I can’t say that I know how you feel, Reggie. Unlike Frank Siller, I’ve not walked in your shoes. I hope I never do. But I just wanted you to know that I’m not looking away from you. Nor am I looking away from what happened to your brother. I see it for what it was – a completely avoidable tragedy, brought about by the wicked actions of an evil man, enabled by the abject failure of a dangerous policy that simply has to change. Anyway, the flight attendant has instructed me to stow my laptop for takeoff, and she doesn’t appear open to negotiations. So I’ll bid you farewell, and thank you for saying hello this morning. All of you. I’m both flattered and humbled to be in your company, and sorry for your loss.